The adolescent transition from juvenile to adult is marked by anatomical and functional remodeling of brain networks. Currently, the cellular and synaptic level changes underlying the adolescent transition are only coarsely understood. Here, we use two-photon imaging to make time-lapse observations of long-range axons that innervate the frontal cortex in the living brain. We labeled cells in the orbitofrontal cortex (OFC) and basolateral amygdala (BLA) and imaged their axonal afferents to the dorsomedial prefrontal cortex (dmPFC). We also imaged the apical dendrites of dmPFC pyramidal neurons. 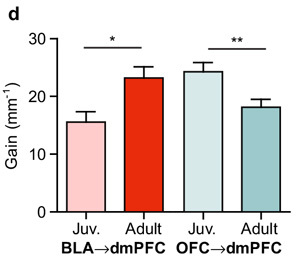 Images were taken daily in separate cohorts of juvenile (P24–P28) and young adult mice (P64–P68), ages where we have previously discovered differences in dmPFC dependent decision-making. Dendritic spines were pruned across this peri-adolescent period, while BLA and OFC afferents followed alternate developmental trajectories. OFC boutons showed no decrease in density, but did show a decrease in daily bouton gain and loss with age. 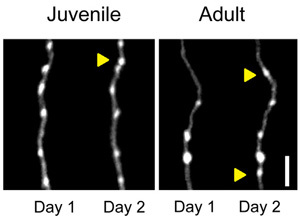 BLA axons showed an increase in both bouton density and daily bouton gain at the later age, suggesting a delayed window of enhanced plasticity. Our findings reveal projection specific maturation of synaptic structures within a single frontal region and suggest that stabilization is a more general characteristic of maturation than pruning. Alexandra Loucks successfully defended her Ph.D. thesis!